Never before has one goat done so much for so many. He is a living testament to all goatkind, a goat who stands alone, who bravely goats where no goat has goated before, and who roams far beyond the hilly scrubland of his birth to ask one ever-pressing question: What on earth is wrong with the humans? Surely they can’t all be this dumb? 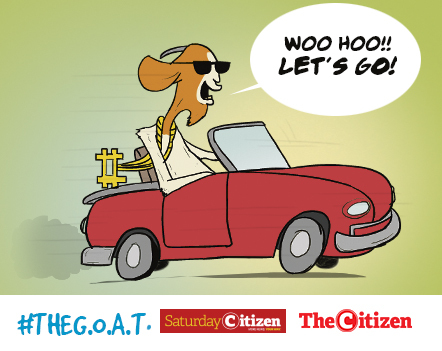 So far the goat is not so sure, but he’ll continue to wonder about this in the pages of The Citizen, from April 1, just as he has done online since 2016. He was a bit disappointed, though, after we told him he was going to be in the paper because of all the initial confusion. We told him, “Hey, you made the paper!” And he got all excited because he thought we speak like rappers and meant he would soon be “making money”. But he’s over that disappointment now and doing pushups to prepare for being a print sensation. So get ready for some “ameheheheeeehzing” satire and comedy, and let’s get our goat on. #GOAT (Hashtag the Goat) is ready, are you?